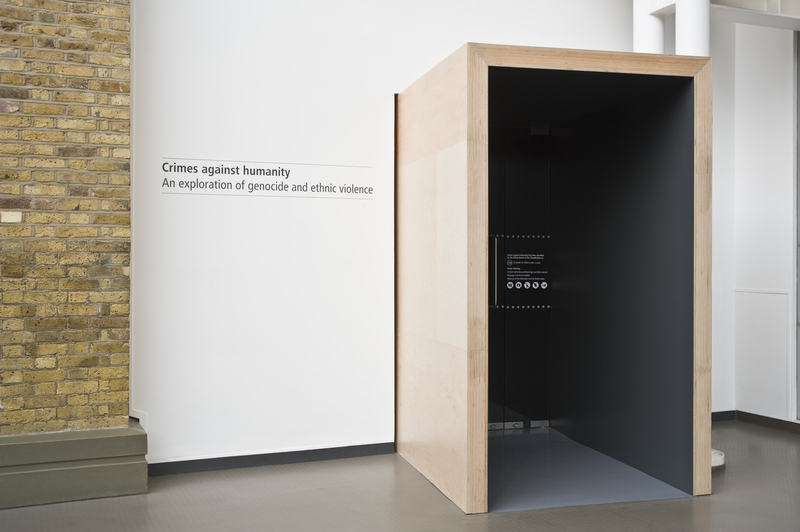 The ‘Crimes against Humanity’ exhibition is located in the London Imperial War Museum, in a small space above the Holocaust exhibition. The exhibition is made up of two parts: a thirty minute film on genocides throughout the twentieth century and an interactive space where visitors can research twentieth century genocides in greater detail. Although the film has a distinctive beginning and end, viewers can start watching it whenever they arrive. Rather than giving a chronological account of violent ethnic conflicts, the film concentrates on the main themes apparent in genocides. It firstly considers genocide’s complex causes by discussing the various ways despotic leaders in the twentieth century pitted neighbours against each other, paving the way for ethnic cleansing. The film then goes on to look at the way the world has responded to reports of ethnic violence abroad. Finally, it concentrates on how the perpetrators are punished – or not – and the aftermath for a country which has been ripped apart by brutal inter-ethnic fighting. The exhibition is permanent and was opened in 2002. The team setting it up was advised by Dr Mark Levene, the only specialist academic teaching a course in comparative genocide at the time. Its purpose was, and continues to be, taking a closer look at why the last one hundred years have been so full of ethnic violence; for example, in World War One, 90% of the casualties were soldiers, but by the end of the twentieth century, 90% of various wars’ casualties were civilians. 1. Does the exhibition aim to have an impact on the way genocide is studied? Our exhibition’s overall aim was to inform visitors to IWM, who may be coming to the museum with little prior knowledge of such conflicts, about the common features of ethnic violence through the film, and also to provide them with a database of different ethnic conflicts which summarises current research under key headings such as ‘Brief summary’, ‘Background’, ‘Course of events’ and ‘Recent developments’. We have therefore not specifically attempted to influence the way academics might approach the study of genocide. 2. Does the exhibition have its roots in any particular academic debate? The exhibition does not have its roots specifically in one particular academic debate, although Dr Levene’s specialism is in comparative genocide, and the film does approach the subject in this way. Further information about Dr Levene’s approach to the study of ethnic conflict can be found here: http://www.soton.ac.uk/history/profiles/levene1.html . 3. How did you select the images and objects which you discussed in this exhibition? The exhibition is predominantly dependent on photographs and film which Victoria Cook and October Films sourced from media agencies to illustrate the texts in the interactive and to present alongside the testimonies in the film. The very content of the ‘Crimes against Humanity’ exhibition has been the cause of much debate. The inclusion of a section focusing on the Armenian genocide has provoked, to date, over 2000 emails of complaint. There has also been contention over whether the exhibition goes too far in suggesting the persecution of indigenous people can be defined as genocide. These facts themselves show that no exhibition on such recent and shocking events can be entirely without controversy. 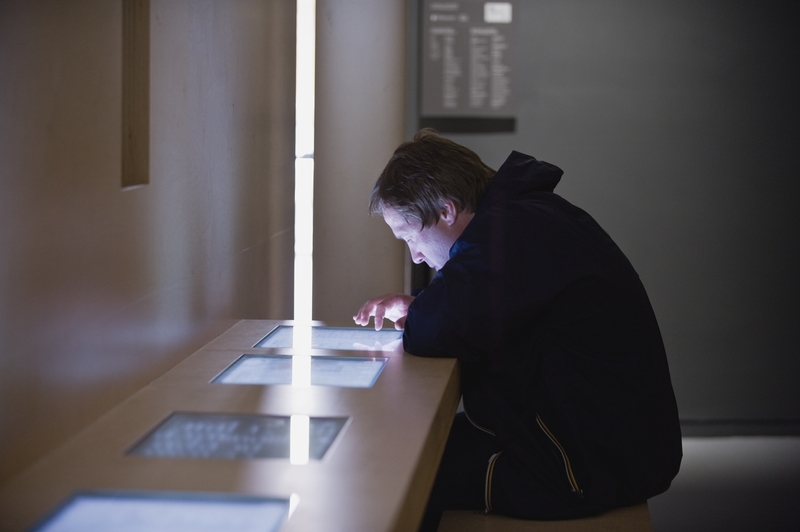 Although the exhibition aims to make its content accessible for all levels of knowledge, it also manages to go deeper by including a wealth of information on the fifteen main genocides of the twentieth century on interactive screens. Concentrating on the ethnic and nationalistic tensions which have lead to ethnic cleansing, its looks not only at well-studied genocides such as that in Rwanda in 1994, but also at those which are discussed less frequently, such as the Herero in Namibia and the ethnic conflict in Biafra. The film itself is particularly interesting in its decision to never show the faces of the interviewees. Rather, when they talk, the film plays a mix of photographs and film clips, some of which are very graphic. At one point, the film weaves together clips of recently dead bodies and Rwandans announcing, “I am accused of genocide.” Whilst this is distressing, it clearly emphasises the message the exhibition is trying to get across: that genocides may culminate horrendously but that they always begin with ordinary people living in difficult situations. 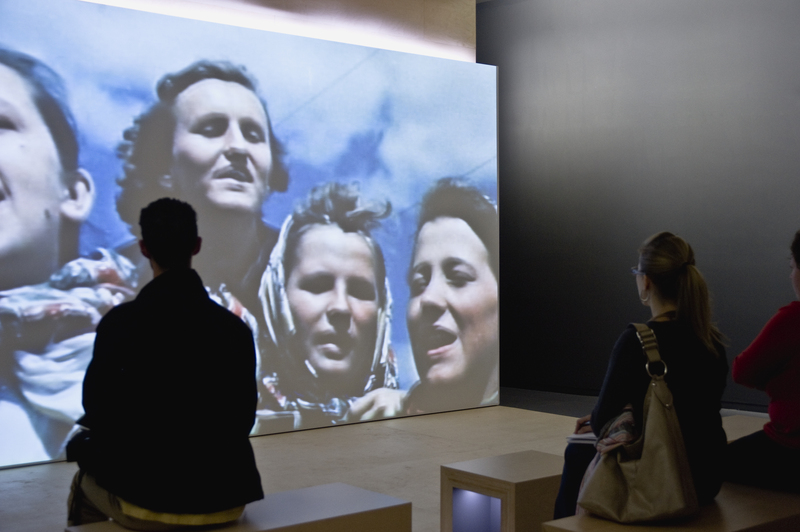 My only criticism is that the benches for watching the film and using the interactive screens were rather uncomfortable; but, then again, overall discomfort is perhaps best for an exhibition that deals with some of the most harrowing and traumatic events of the last century. All Images copyright of the Imperial War Museum. This entry was posted in Exclusive Interviews, Exhibition, General and tagged Exhibition, Genocide and Ethnic Violence, Imperial War Museum. Bookmark the permalink.